From crisp moonlit approaches through sublime sunset summits, on mixed routes and backcountry tours, the Nano-Air® Jacket is a breakthrough in active insulation for high-output, stop-and-go alpine missions in the cold. Its stretchy and highly breathable fabric package integrates the qualities of fleece, soft shell and puffy by combining our warm-when-wet FullRange® insulation with a plain-weave liner and a lightweight, weather-shedding 100% nylon ripstop shell, which we’ve improved for durability. All of which means you can put it on and leave it on. The incredibly soft, supple feel and full mechanical stretch allow for a close, updated, femininely sculpted fit over baselayers and an uninhibited range of motion. At chilly belays or in frigid conditions, pull on a lightweight shell and the Nano-Air’s thermal properties skyrocket. The left-chest pocket and two above-harness handwarmer pockets all close with trim, low-bulk zippers. The center-front zipper has a storm flap and zipper garage, a dual-adjustable drawcord hem seals in warmth and the newly refined cuffs feature a sleek, low-bulk, stretch-knit inset. The jacket has a DWR (durable water repellent) finish. 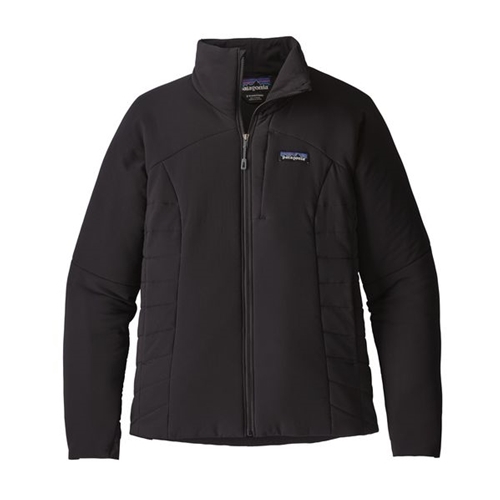 This Patagonia Women's Nano-Air Jacket not only looks great, but is also very comfortable to wear and this Patagonia Women's Nano-Air Jacket keeps me nice and dry and warm in the cold weather months here in Montana.